Early morning after the full moon, we were headed to the Red River north of Lockport. 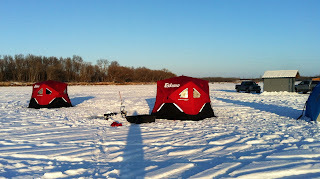 My wife and I were making our first attempt at ice fishing the red and after a great trip in the fall, we were excited to be heading back. The weather had been consistently cloudy with similar temperatures for a few days, but that looked to be changing, none the less this was our chance for a day of greenbacks, sauger and what ever else the river was going to surprise us with. We met up near Lockport with some forum members and friends and made our way north up highway 204 to CIL road. After heading down the hill to the area before the river bank, we got out of our vehicles to asses the situation. There were permies as far as the eye could see in either direction. We saw an area free of shacks and decided to head for it. Smoke already rising from some of the shack chimneys, the sound of augers and snowmobile engines revving in the distance, we drilled some test holes and found 15 feet consistently and decided to claim our spot and give things a go. a sauger, first fish, no skunk, things could be worse. Although in a fit of rage I cut the jig head off my wifes second rod and not my screwed up one. Sorry!!! 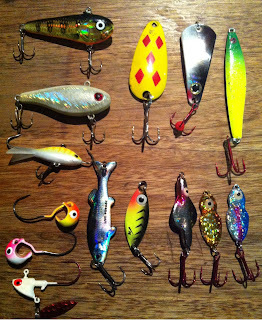 We were mostly using knuckleball jig heads of different colours, baited with 2 salted minnows, some with spinners some without. We also spent some time playing around with rattle baits and some spoons as well. After finding out our new reels weren't performing the way we had hoped, we decided to just use one rod each between my wife and I, and set up a tip up with a 6 inch herring. The bite was a lot of fun from just before sunrise until about 9 30 am, then it slowed down a bit. 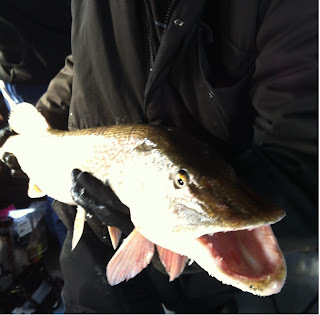 My wife and I were getting some small sauger and walleye, TommyV and his girlfriend were catching some sauger as well. On our west side the guys were getting some nice marks with Fisher45 landing a fat 26.5 inch greenback and another angler in our group icing a 27.5 incher fishing blind. This got the adrenaline flowing throughout the group. With some marks showing frequently on the flasher, we kept at it. The bite really slowed down after 10 30 as the weather began to change. Between the seven of us about 30 fish had been iced so far. Most fish were on the bottom, and not easily enticed. There were some mid level cruisers as well that were showing up on the newly acquired Humminbird 55. This unit was already proving its worth with the fun it had provided and visual representation of the action below. 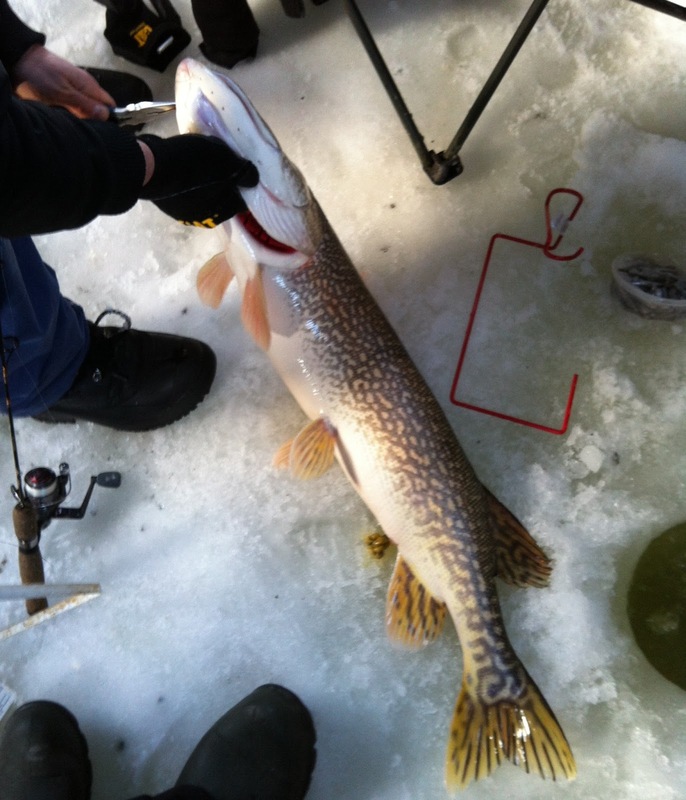 A few bigger feeling fish were lost on the way up with another one snapping the line of a fellow angler while the fish dragged and bumped under the ice. Right when we were thinking about moving a mile away to an area we fished in fall, I decided to spend few more minutes jigging. It wasn't long before a huge mark slowly began to rise up from the bottom on the flasher, my heart rate increased as it swam up past my jig. I slowly followed it up to around 12 feet and it stared for at least a minute and then slammed the jig hard. I set the hook and started to reel in and it spit the hook. A few curses as i let the jig float back down which is a technique by the way (just YouTube river monsters curse fish) and BAM fish on again, my heart raced on as whatever was below had a lot of power and half way up it went on a decent run. I was thinking pike or catfish and did my best to keep my cool. After losing a nice sized pike by the boat this fall I was looking for redemption of any sort and this was it, I could not lose this one. Another run or two with some drag adjustments and i got it near the hole where we saw its head. 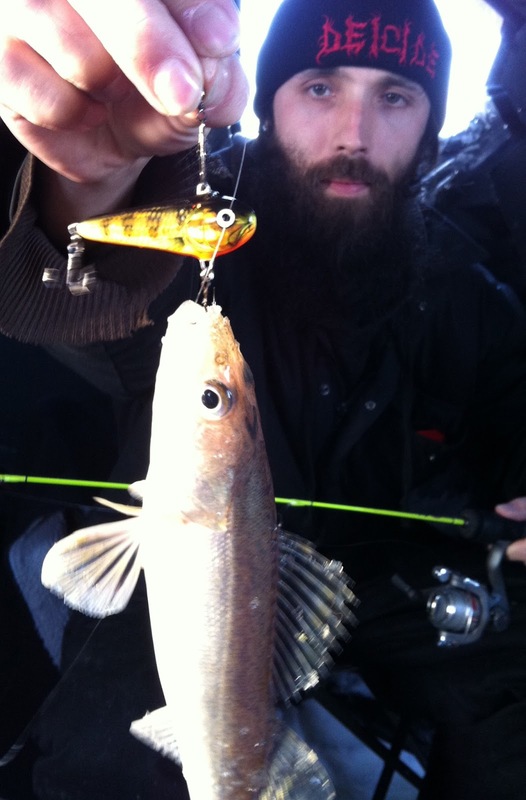 It looked like a nice sized pike and when it saw us, off it went again, FLAG!!! My wife, who I had informed would have to shove her hand down there and grab this fish was now over about to retrieve the flag. We were quite excited at this point, was it the same pike eating the herring while it fought, was there another one near by whose hunger was stirred? She began to retrieve and fealt nothing, the line was bit. Lesson learned use leaders on tip ups. During the fight and the flag going off I was forced to call for Fisher45 to assist in getting the fish out of the hole. I did not want to lose another pike and wasn't calling anyone over up untill now as to not embarass myself if I did lose it. Fisher45 came over calmly to grab the fish out of the hole when the time came, a few more runs and there it was my personal best pike at 37.5 inches, caught on medium ice rod with 8lb line and a jig head with two minnows. Fisher45 got the hook out, while we got the camera ready for some quick pictures, (not the greatest but we kept it in the shack). A moment of unexplainable joy passed and off it went back down the hole to feast and fight another day. It might not be a master angler but it was a great fight and will be an awesome memory for a long time to come. The bite got fairly dull after 1 pm and a lot of folks with permies were leaving. Not living near the red, we decided to stick it out as long as we could. The action never really reached the same point as the morning fun, a few more saugers for the afternoon and some real nice marks and missed hooksets. It was at that point we threw almost everything we had at them. A few lookers on the flasher and some obvious bait moving through, but the beasts were done for the day, at least with our group they were. 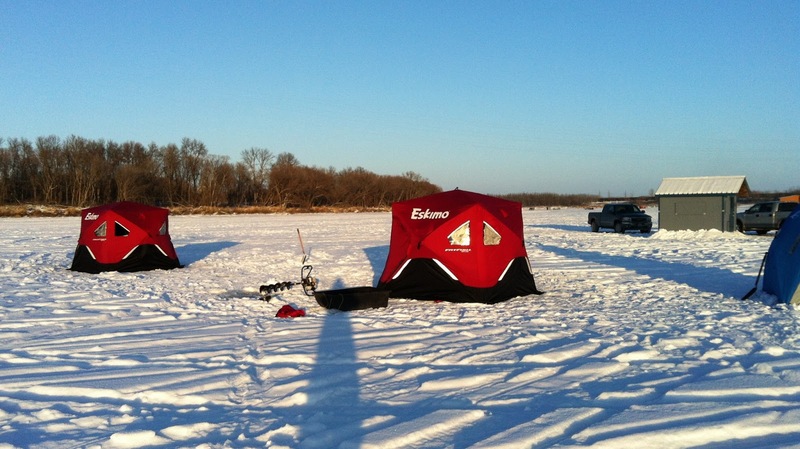 Between us there were easily 50 fish iced and a good time had by all with a few personal bests. We were off the ice by 5 pm, but trapped at the bottom area because of a few trucks and a trailer having some trouble on the hill. A tow truck was helping out so this gave us some time to go over the days events as we warmed up in the car. Each trip out no matter what the season, or body of water, there is always a good time to be had. Friends, fishing and the great outdoors, you really can't ask for much more. After a while the trucks were on their way and the path out was moving again lucky for me my car made it up ... the second try. Thanks to everyone that came along that day, I look forward to a trip like that again.